Cyanweb Solutions provide a comprehensive keyword ranking report service so you can keep up to date of your natural rankings in the major search engines. No more having to search and scan through results to find out where you are listed for your chosen keywords. 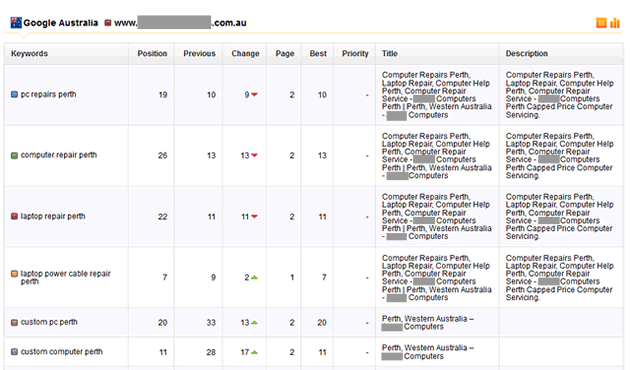 Keep informed of the big picture showing where your are and need to be for your business keywork search terms. Our reports can be linked to your Google Search Console, giving you details statistics on which of your keywords are popular, and how many times your link is clicked on. Keyword ranking reports help fill in the blanks as to what keywords you may want to spend money on to achieve optimal results in your marketing. We offer keyword ranking reports which are automatically emailed to you either weekly, fortnightly or monthly. Combined with our monthly SEO services or Adwords Optmisation services, Cyanweb can help you improve your return on investment in your digital marketing. Contact us today with your domain name and keyword list and we will setup your keyword ranking report service ASAP.